Construction Consulting is an advisory function which can be provided at any phase of the design or construction process. It allows our clients to utilize and benefit from our extensive experience and knowledge of construction in order to make the necessary timely and cost-effective project decisions. This service provides our client with a clear understanding of the construction process. Typically an in-depth review of all existing construction documents is conducted. 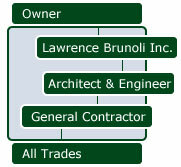 Lawrence Brunoli, Inc. then provides an indication of constructability issues, potential high cost areas, problems relating to availability of labor and/or materials needed in the proposed design, and any possible scheduling conflicts that may arise. Upon indication of the foreseen issues, recommendations are then provided to avoid and or correct the specified items.